Some of the biggest parties in the United States will happen this weekend for Super Bowl LIII, but out in Arizona the PGA Tour will throw a giant kegger of their own on the 16th hole at TPC Scottsdale for the 2019 Waste Management Phoenix Open. While neither the field or the golf course itself are anything other than ordinary, the tournament is one of the few non-major golf events that breaks through into the sports mainstream. The event is behind the eight ball to draw any attention away from the biggest sporting event of the year, but it embraces it’s reputation as wild party to make it relevant on a crowded sports weekend. It’s very self-aware of what it is, and uses it to create one of the most fun and hyped events on the PGA Tour. As for gamblers, the event not only offers up the usual props to bet on but also features fun prop pairings with the Super Bowl. Here’s a rundown of everything there is to know before placing wagers this weekend. While not as strong as the field at Torrey Pines, several big names will enter the gladiators pit to the cheers of the masses. Twenty-three of the world’s Top 50 golfers will vie for the trophy as the King of TPC Scottsdale to lord over a sea of empty solo-cups and boozy sun-baked patrons. Justin Thomas is the top ranked player in the field this week and is looking for his first win of the 2018-2019 season. 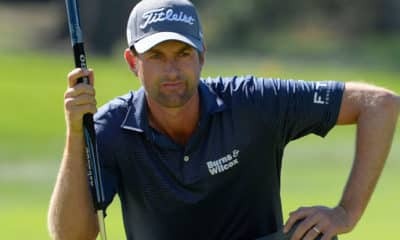 Though he had a run in with an overserved fan at the Honda Classic last year that ruffled a few feathers, he typically embraces the party atmosphere at TPC Scottsdale. Joining him are a pair of Arizona State alums in Jon Rahm and Phil Mickelson, both of whom fire up the crowd when they throw on a Sun Devil football jersey and hit their tee shot at the 16th. Others notables names in the field include Rickie Fowler (who always seems to play well at TPC Scottsdale no matter how his form is coming in), fan favorite Bubba Watson, and a resurgent Hideki Matsuyama on the heels of his T3 at Torrey Pines. The property of TPC Scottsdale holds two golf courses, both of which were co-designed by Tom Weiskopf and Jay Morrish. The commissioner of the PGA Tour in 1986 directed the two architects to build another golf resort for the TPC network that had the look and feel of TPC Sawgrass. Out of this endeavor gave rise to the Champions Course and the Stadium Course, the site of the main event this weekend. TPC Scottsdale is likely on the bucket list for more mainstream golf fans based solely on the insanity of the 16th hole alone. But the dirty little secret about TPC Scottsdale is, for the most part, it’s a bland, mediocre, cookie cutter golf course that plagues most other TPC’s. Normally I find lack of early round coverage frustrating because sometimes great holes on the front nine of a golf course don’t get the air time it deserves (bookmark this for next week’s AT&T Pro-Am at Pebble Beach next week). However, there’s very little that piques my interest about TPC Scottsdale as a viewer over the first fourteen holes. It suffers from a lot of the pitfalls that the South Course at Torrey Pines does as discussed last week – lots of similar looking Par 4’s with a fairway bunker near landing zone off the tee. There’s not many decisions to make off the tee, as there’s nothing the golf course offers over this stretch that compels anyone to hit anything other than driver on the Par 4’s and 5’s. Unlike the South Course at Torrey Pines, though, most guys should be able to get good contact on the golf ball if they find the rough off the tee to give themselves a good look at birdie on the receptive, larger greens. 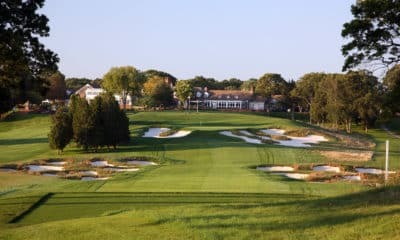 On the 15th tee-box, the golfers will begin to hear the madness reverberating from the grandstands of the 16th, but they’ll have to tune that out with a good drive to set up their approach. It’s also very important to card a birdie here if one wants to win the tournament. Gary Woodland carded a birdie on the 15th in three out of four rounds on his way to win the tournament in 2018. Hideki Matsuyama birdied it six out of eight tries on his way to winning back to back in 2016 and 2017. And Brooks Koepka eagled this hole in the final round of the 2015 event to help him capture his first career win on the PGA Tour. On it’s own, the hole is quite a stress-less endeavor. It plays as little as 115 yards and as much as 160 into a relatively flat green where four greenside bunkers present the only challenge. 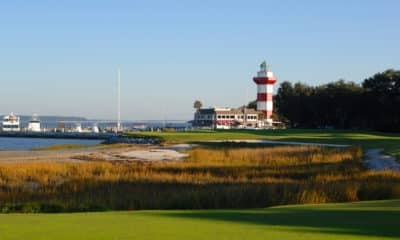 But when you surround the hole with a giant frat party attended by 20,000 drunks who’ll boo you if you aren’t within 20 feet of the pin, it makes the tee shot a whole lot more nerve-wracking and gets the golfers out of their comfort zone where they can hit some uncharacteristically ugly shots. For those who’d rather go to watch golf instead of take funnels of Miller Light from sunup to sundown, the place to be on the course is actually the next hole over at the short Par 4 17th. This is probably the best hole on the golf course in that it’s a high risk-high reward hole where tournaments have been both won and lost. Pros have two options when they step to the tee at the downhill 332 yard 17th. They can either layup down the rightside of the fairway, past the centerline bunker and set up an easy approach into the large green. That’ll ensure at worst walking off the green with a par, as well as earn a few boos from those waking up from their early afternoon alcohol coma. The hole is also heavily bunkered just off the fairway. To the right are a trilogy of fairway bunkers that are in the landing zone of all hitters long and short. To the left is a row of church pew bunkers that probably aren’t in play for anyone. It would take a very aggressive line to play a draw towards the water off the tee to bring these into the conversation. They’re mostly just there as eye-candy. Still, with all the challenges presented off the tee it sets up drama should the tournament still not be decided heading down the stretch. As mentioned previously, there’s very little reason not to hit driver off the tee at most holes at TPC Scottsdale, so those who excel in that area tend to populate the top of the leaderboardy. However, even though the greens are very easy to hit in regulation, it’s those who are able to have full control over their irons to give themselves as many good looks at birdie as possible that rise to the top. The winning score of the tournament has been at least -15 every year since 2010, including Phil Mickelson completely torching the course by shooting a winning score of -28 in 2013. Most of the Top 20’s in recent years include players who rank highly in Strokes Gained-Approach and in scoring on approaches between 150-200 yards. Targeting players with hot iron play of late is the way to go this week. A compelling case can be made for anyone on this list to be in the winners circle by the time Gladys Knight wraps up the National Anthem on Sunday evening. Most of the golfers in this group are in excellent form, and those who aren’t (**cough cough Rickie cough**) have positive course history at TPC Scottsdale, and given their ball-striking pedigree can turn their game around in a hurry. Avoid playing any of these in matchup plays against each other, as I’m not seeing any clear-cut fade to bet against in this group. If there’s a gun to my head and I had to put down futures bets on three golfers to win the tournament, it’d be Justin Thomas, Hideki Matsuyama and Rickie Fowler. Justin Thomas seems like always my default pick to win a tournament as his ball-striking is so good into greens. At the Tournament of Champions, Thomas gained 2.7 strokes over the field on his approach shots, and at the Sony Open he gained 1.43 in the same metric. The issue for Thomas of late has been a mediocre 1st or 2nd round to put him behind the eight-ball quick, but if he can keep the ship afloat he’s one of the best closers on the PGA Tour. Hideki is officially back. The wrist injury that ruined his 2018 season and the ghosts of losing his grip on the Wannamaker Trophy in 2017 seem to be exorcised, and he’s returned to playing the elite level of golf his fans are familiar with. Matsuyama gained 2.14 strokes on the field tee-to-green at Torrey Pines last week, including 1.31 strokes gained on his approach shots. Matsuyama is also a menace at TPC Scottsdale. Excluding his withdrawal from last year’s tournament due to the wrist injury, his average finish at TPC Scottsdale is 2nd with a pair of wins. He’ll be popular on DraftKings this week, but that won’t deter me from using him as the anchor of a lineup. Fowler was pretty bad at Torrey Pines last week. He lost about a stroke to the field tee-to-green and lost over a stroke to the field on his approach shots. In the past, this is when I would fade Rickie hard and bet against him in almost any matchup prop I can find. Anytime I seem to do this, though, he bounces right back with a strong performance the following week to make me throw my ticket into the trash by Friday afternoon. I have a sneaky suspicion Rickie bounces back this week with a good performance. He’s way overdue for a win, and at a place he’s averaged a 6th place finish his last three years he might very well break his slump. Cameron Smith – 28/1, $9,100: Something clicked for the young Australian at the start of the FedEx Cup in 2018. Since that time, he’s racked up six Top 10’s in 11 starts including a win a the Australian Open in December. He’s off to a good start in 2019, particularly with his irons. He gained about a shot on his approach shots over the field at the Sony Open, then followed that up by gaining 1.23 strokes on his approaches at Torrey Pines last week. With a firm control over his ball-striking, Smith should linger around the Top 10 once again this weekend. Emiliano Grillo – 66/1, $7,600: While Grillo cashed in a matchup prop I had with him over Aaron Wise by Friday, he disappointed the rest of the Farmers Insurance Open after an opening round 67. After that, he played +3 the rest of the way to finish a lackluster T52. So what went wrong? Looking at the stats, Grillo was really bad on and around the greens at Torrey Pines, losing about a stroke and a half on and around the greens to the field last week. It’s an area he’ll need to fix in a hurry if he wants to play well at TPC Scottsdale. But given that the greens there are very receptive and he’s still striking his irons well, he could be in for a nice bounce back this week. Daniel Berger – 66/1, $8,200: Berger hasn’t been the sharpest since his return from injury, following up a solid debut at the Desert Classic with a T12 with a missed cut at Torrey Pines. There’s still some positives for his outlook this week though. For one, he bounced back from a 75 on the South Course with a nice 69 on the North Course. Second, despite flaming out at Torrey Pines he still ranks 40th in Strokes Gained Tee-to-Green and 55th in Strokes Gained – Approach after two tournaments. And third, he has a very favorable matchup prop against Cameron Champ this weekend. While Champ has been a god off the tee this year, he’s been awful in almost every other statistical category. That’ll cost him this week, and I like Berger -140 against him at TPC Scottsdale. 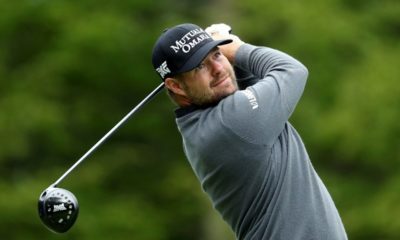 Ryan Moore – 120/1, $7,200: Moore had a rough go of it in his first tournament of the calendar year at Torrey Pines, missing the cut with a disastrous second round 76 on the easier North Course. Before that Moore had been fairly solid, including a T2 at the Safeway Open back in October. Moore isn’t the flashiest of players and has a very unorthodox (ugly?) swing, yet is one of the more consistent iron players on the PGA Tour. Though the last two years haven’t been too good for Moore at TPC Scottsdale, he had four straight Top 20 finishes there from 2013-2016. I like considering him for another Top 20 finish this weekend at 4/1. Anders Albertson – 220/1, $6,300: Now here’s a real sleeper from the bottom of the barrel. There’s been a lot more noteworthy performances from the most recent graduates from the Web.com tour this year, but Albertson hasn’t been too shabby either. On the year he’s made 5 of 7 cuts, ranks 26th in Strokes Gained Tee-to-Green and 12th in Strokes Gained-Approach. He’s a great flyer at the end of a DraftKings lineup to squeeze in one or two more high priced golfers, while also having the upside of being a nice contributor to your team by making the weekend. Rahm’s averaged a score right around 70 in his career in the 4th round, so the implied length of the longest TD in the Super Bowl is about 50 yards. The Rams and Patriots only have a combined five offensive touchdowns this year that went over 50 yards, with three of them coming from Josh Gordon and Cooper Kupp, both of whom will not be playing in the Super Bowl. Both teams have only one offensive TD over 50 yards since Week 10. While both teams are susceptible of giving up big pass plays on defense, neither team’s offense is one that goes for the home run. Both offenses are of a quick hitting variety to move the chains consistently all the way to the end zone. The only real threats here seem to be either a special teams or a defensive return for a TD, Chris Hogan or Brandin Cooks getting behind the defense, or James White taking a screen to the house for a long score. I’ll bet against all of those scenarios and take Jon Rahm’s final round score -20.5 over the longest TD of the game. This one plays along the same lines as my thinking on the prop above. The average yardage of all offensive TD’s scored by the Rams and Patriots this season is about 13 yards. Given an over/under total of 56.5 and the Patriots favored by 2.5 points, the implied final score is about 30-27. That computes to about six TD’s for the game, meaning we’re setting an implied total yardage on TD’s here at about 78. At this average, Rickie would have to do what only eight players in PGA Tour history have done and shoot a sub-60 round on Sunday to not cover this spread. Like Rahm, Rickie also hasn’t been the greatest closer at tournaments in recent years, so the real number to shoot for is about 88 combined yards on all TD’s in the Super Bowl. Again, as long as bettors can dodge a return TD the odds are in Rickie’s favor to cover this spread with his final round score.